Those looking to spend Christmas money on a new iPod shuffle may have to wait a few days to pick one up. As reported by 9to5Mac and confirmed by our own contacts at Apple Retail, Apple’s diminutive iPod is out of stock at many Apple Retail Stores, and shows a 7-10 business day shipping delay at Apple’s online store. Sources at two U.S. Apple Retail stores told TMO that it has been “a matter of weeks” since new iPod shuffles arrived as part of regular resupply shipments, and that some colors of the shuffle have been out of stock for quite some time. 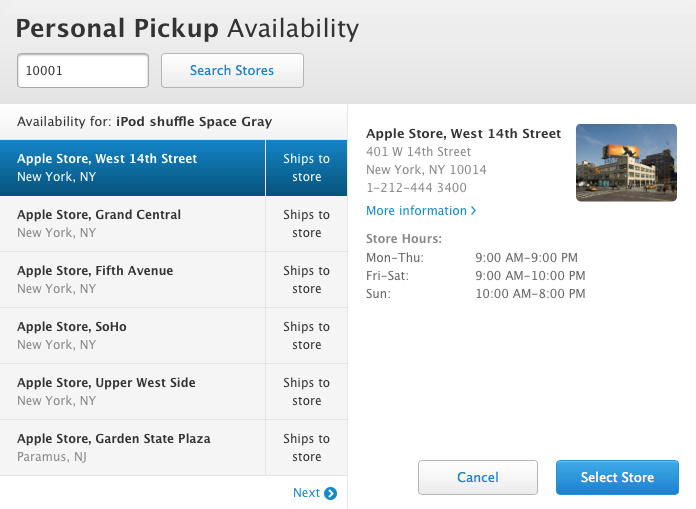 Our sources report that local store management has directed employees to refer customers seeking an iPod shuffle to the Apple online store and to third party retailers in the area who may still have supply, but that no information or directive from Apple’s corporate operation has yet reached them. However, both sources underscored that the shortage has not been a major issue thus far, with the stores selling only a “handful, if that” of shuffles per week on average. There’s no word yet on the exact cause of the shortage, and Apple has made no announcements or moves to indicate that they are planning to discontinue the line, which currently represents the cheapest way for new customers to enter Apple’s mobile ecosystem. The current iPod shuffle was last updated in September 2013. It is available in only a 2GB capacity with eight color options. Those looking to pick one up should note that our sources tell us that the Purple and Yellow models were the least in demand, and may still be available at some stores.